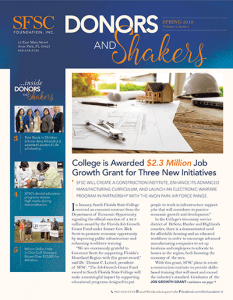 The South Florida State College Foundation enhances community awareness of the College, solicits and accepts gifts, receives bequests, and manages and helps to appreciate cash gifts or non-cash gifts donated to the SFSC Foundation. Such contributions are tax deductible to the full extent allowed by law. Funds received by the SFSC Foundation are distributed to endeavors that benefit the College and subsidize its students, staff, and programs. The SFSC Foundation offers scholarships and provides funding to maintain educational facilities. You can make donations to the Foundation by credit card over the phone and make donations to the Partnership Project via Paypal.